Hong Kong, 26 June 2018 – Ambi Climate, the revolutionary air conditioner (AC) accessory that uses artificial intelligence (AI) technology to redefine the ACusage paradigm, comes with a range of new smart features. Ambi Climate’s new features include voice control with Amazon Alexa and Google Home (available soon), and geolocation capabilities. Developed by Hong Kong-based IoT startup Ambi Labs, Ambi Climate employs AI technology to analyze factors affecting users’ comfort, delivering enhanced, personalized comfortwith energy savings. Ambi Climate’s unique AI engine leverages data from multiple sensors and analyzes the impact of temperature, as well as the “other” key factors ignored by traditional ACs – humidity, sunlight, weather and time of day – on thermal comfort; automatically adjusting the AC for optimized comfort based on users’ preferences. Thanks to Artificial Intelligence, Ambi Climate collects all the data and analyzes it to achieve personalized comfort that matches the user’s needs and well-being. With “Comfort Mode” you only need to communicate via app if you are hot, cold or comfortable; this way the AI engine will learn how different factors impact you and will automatically regulate the conditions, creating a personal comfort profile. Voice Control With Amazon Alexa, Google Home And Smart Home Integrations The global smart home market is expected to increase by nearly 250% in terms of unit shipments from 2017 to 20191. With consumers in Asia, particularly China, leading in voice-activation technology adoption2, smart homes are a hot topic. One of the top trends sweeping the smart home market at this year’s Consumer Electronics Show (CES) has been the further integration of consumer connected devices with leading voice-based AI assistants. With rapid technological advances in voice control and AI, the intelligent assistant is now a viable control center for the modern, connected home. Ambi Labs has now successfully integrated Ambi Climate with Amazon Alexa that users can control their ACs with voice commands. By speaking to Alexa, the AC can be switched on or off, and adjusted by giving individual comfort feedback throughout the day. For example, users can let Ambi Climate know their comfort level by saying “Alexa, tell Ambi Climate I’m cold.” Apart from Amazon Alexa, users can also utilize voice control with Google Home via IFTTT. An official Google Home integration will be available later this summer. Ambi Climate also offers full IFTTT integration and an open API, allowing user to have complete control on the tip of the tongue or fingers, while enjoying a truly intelligent home automation experience. Geolocation Enhances Comfort While Improving Efficiency The introduction of Ambi Climate’s new geolocation feature means the AC unit can be set to automatically turn on when a user is approaching their residence, and be turned back off when they’re leaving, ensuring optimal comfort and efficient electricity usage. While Ambi Climate users could previously monitor and control their ACs on-the-go through the smartphone app, the newly-added geolocation feature allows for communication between devices without active user involvement. About Ambi Climate Ambi Climate was born out of a simple need to solve the common comfort problems encountered by many while using the ACs. A series of consumer interviews conducted by Ambi Labs in markets including Hong Kong, Singapore, Japan and Australia revealed that users frequently struggle to maintain an ideal temperature when using traditional ACs. Issues such as waiting a long time for hot rooms to cool down, waking up to an overly cold bedroom or dealing with indoor temperature fluctuations caused by changing weather conditions are common. Since its inception in 2012, Ambi Climate has proved a popular smart home accessory in more than 40 countries worldwide, boosting comfort and virtually eliminating overcooling and overheating for users, resulting in up to 30% savings on energy consumption. 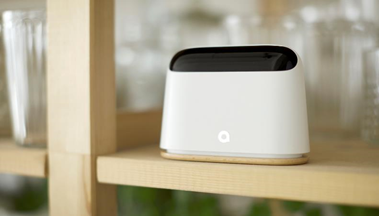 About Ambi Labs Ambi Labs is an IoT startup founded & headquartered in Hong Kong. Inspired by the concept of “Ambient Intelligence”, we believe that truly smart technology is intuitive and seamless; fading into the background and augmenting the user’s lifestyle. We believe that the promise of IoT can only be fully realized through the application of AI – many IoT devices today inundate the user with data, and only allow simple, rule-based control. Through AI, we are able to unlock the insights from the data and offer delightfully intelligent appliances.